During my store excursion, my partner Julie and I decided to go to the Union Square Forever 21. When we arrived there wasn’t much activity in the store which I can only assume was due to the time of day. However, before entering the store I thought surely forever 21 would have an abundance of signs this assumption turned out to be rather incorrect. In fact, the store was so void of signs that Julie and I decided to turn to the clothing in search of signs instead. A common theme throughout the clothing was that they mostly had cutesy sayings or advertisements for other brands on them. 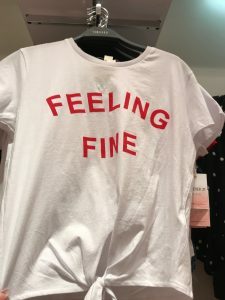 Found more specifically on t-shirts, some examples of these sayings are feeling fine and bonjour baby as well as collaborations with brands such as Honda. Throughout the store there was an abundance of athletic wear categorized by a color scheme of mostly red, white, and black, however, the fabrics varied but it was apparent that the overall concern seemed to be comfort and functionality. The silence of the store was filled with soft music to enhance the shopping experience and create a somewhat relaxing environment to ensure that customers are in a good mood. This is an imperative aspect because when shoppers are in a good mood they tend to buy more which, at the end of the day is the stores one and only goal. When shopping there are a few unspoken rules such as the way we interact with others customers looking through the same rack as well as the tone in which we talk while shopping. 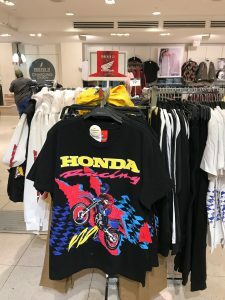 Forever 21 is known for its affordable on-trend items which are why the store does not really exclude based on wealth. However, the store is obviously not geared towards people of certain age hence the name of the store being Forever 21. Also having to do with age the brand upholds the cultural myth that you can only wear certain things when you are of a certain age. While we were in the store Julie and I discussed how surprised we were by our findings Julie stated “It’s amazing how much you notice isn’t here when looking” Stated in the reading Popular Signs, “words to are signs you read them to figure out what they mean,”(pg 7) supports the idea that signs can be found in other forms besides the ways we see so frequently. This relates to our excursion because once we couldn’t find the generic poster or advertisement sign we used our resources and looked elsewhere which I believe speaks to the meaning of this quote directly.